‘To London, mainly for another Prime Minister’s dinner party [. . .] I continue to find Mrs Thatcher very attractive physically. Her overhanging eyelids, hooded eyes, are the only suggestion of mystery (a characteristic I like in women). This is Anthony Powell - born 110 years ago today - the British author of A Dance to the Music of Time, making a somewhat surprising confession to his diary. He was not far off 80 at the time, and she was closing in on 60. Anthony Powell was born in London on 21 December 1905, the son of an army officer. He was was educated at Eton and Balliol College, Oxford, and then worked at the publishers Gerald Duckworth and Company for ten years. In 1934, he married Lady Violet Pakenham, sister of Lord Longford. They had two sons, one in 1940 and one in 1946. After leaving Duckworth, Powell did some script writing and some travelling in the US and Mexico. On returning to England in 1937, he lived in London and worked as a full-time writer, producing novels and literary criticism. During the Second World War, Powell joined the army and rose from the rank of second lieutenant to major, serving first in the Welch Regiment and then in the Intelligence Corps as a liaison officer with Czechs and Poles among others. In 1951, he published A Question of Upbringing. This was the first novel in what would be 12 volumes, written over a quarter of century, making up A Dance to the Music of Time for which Powell is most remembered. In 1952, he moved to Somerset where he spent the rest of his life. Powell also wrote other novels, two plays, many literary reviews, and autobiographical works. He served as a trustee of the National Portrait Gallery in the 1960s and 1970s, and was also a vice-president of the Society of Genealogists. In 1956 he was awarded a CBE, and, in 1988, was made a Companion of Honour. But, in 1973, he declined a knighthood. He died in 2000. Further information can be found at Wikipedia, the Anthony Powell Society or The Guardian. In the early 1980s, when already in his 70s, Powell decided to begin keeping a daily journal, and, in time, these were published by William Heinemann in three volumes, each one spanning 3-5 years. The first to appear in 1995 was Journals 1982-1986, then came Journals 1987-1989 (in 1996), and finally Journals 1990-1992 (in 1997). According to his wife, Violet, who provided an introduction to the first volume: ‘The idea of keeping a journal appealed to Anthony Powell as bridging the gap when a novel was not in immediate production.’ She adds, the five years covered by the volume ‘make an effective sequel to the author’s memoirs, the last volume of which was published in 1982. 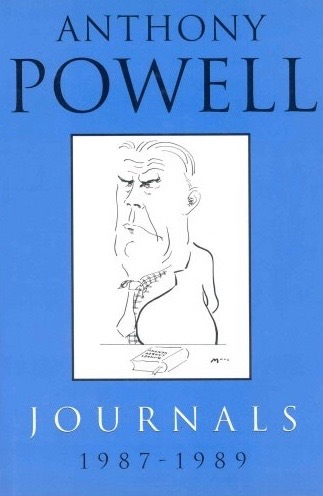 Further information about Powell’s diaries is available online in Chapter Six of Understanding Anthony Powell by Nicholas Birns (University of South Carolina Press, 2004) at Googlebooks; or in an article by Christopher Hitchens for The New York Review of Books. Two volumes of the diaries themselves can be previewed freely at Googlebooks (Journals 1982-1986, Journals 1990-1992). Here, though, are several extracts. ‘To London, mainly for another Prime Minister’s dinner party [. . .] At dinner, to my great surprise, I was put on Mrs Thatcher’s right, with Vidia Naipaul on her left; on my other side was John Vincent. At one time or another I had read a lot of reviews by Vincent, some of them no great shakes, so far as I remembered, others pretty good. He has a notably prognathous jaw, perfectly civil manner. We did not have much talk, as I was fully occupied keeping my end up with the Prime Minister, while Vincent probably thought he had to make some sort of showing with his fellow don, Tony Quentin, on his other side.